Century Cycles Blog: 1800 miles in New Zealand with "Wonder Woman"
I recently had the unique opportunity to travel to the north island of New Zealand last month for the Single Speed World Championships. When they announced the SSWC 2010 was being held in New Zealand I knew it was time to pull out the passport, book the ticket, box the SS and make a return trip to Kiwi country. I had been to the south island before, so this trip was all about the north island. I flew into Auckland airport on a Thursday morning, acquired "Wonder Woman" (pictured above) and began my 1800-mile, three-week adventure of driving on the wrong (left) side of the road. Tip for future overseas travelers: GPS are fantastic inventions. 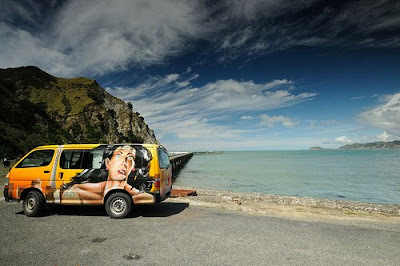 New Zealand is a country set up for camper vanning and road trips. The towns are not far apart, and holiday parks (campgrounds) are located in all but the very smallest of towns. They all had kitchens with sinks, range tops, ovens and such; shower and laundry facilities; and information on all things local. Most evenings were spent in the heated kitchens swapping stories, drinking, and trading info on cool things to do and the best holiday parks. 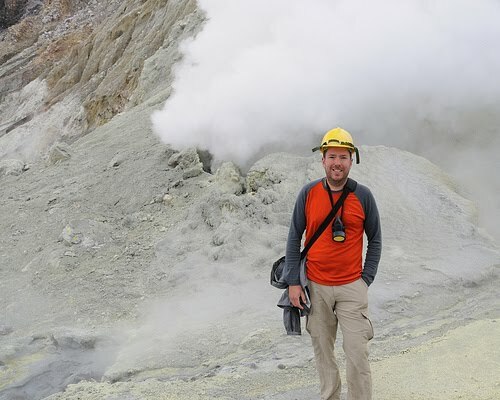 The kitchen is where I learned my best bit of info on White Island -- an active volcano 25km off the shore of the north island. Yes, active. While it did not have the flowing lava of Hawaiian volcanoes, you were still issued a hard hat and gas mask. So on to the reason I was there -- to ride my SS mountain bike. The trails in New Zealand are simply amazing. Volunteer groups have done an amazing job building trails in all but a few areas of NZ. 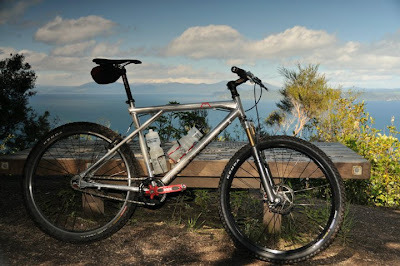 The trail that sticks out in my mind is the W2K trail near Taupo. It was 17 miles of two-foot-wide single track heaven with views that never stop. The race itself was a curious little circus in Rotorua that all who enjoy cycling and beer should check out sometime. With the beer tent opening at 9am and the race not starting till 10:30ish (that was the printed started time), tell me it is not a laid-back atmosphere. So I had to loosen up with a pre-race beer, take the edge off at the half way point of the first lap, chug one back at the start to get the courage to go back and do another lap, and yes at the half way point have another beer to ease the pain. Oh yeah, then there was the post-race beers to celebrate and take the pain away. Even with all the festivities I completed my goal of finishing the SSWC, even though I have no idea what place I was in. All they keep track of is who wins for both men and women. So off to the after-party I went, where I got a chance to meet and buy a beer for the men's winner, Garth Weinberg. I slept off the effects and, the next morning, Wonder Woman and I were off again to see a little more of New Zealand before it was time to return to America.